Protect a garden, or whistle while you work, when you wear this Plus Size Papa Gnome Costume For Men! The 100% polyester interlock knit tunic is bright blue with a mushroom print design around the neckline and a black faux leather belt with a silver foam buckle sewn to the front waist. Brown velvet vest panels are sewn to the shoulder and side seams and connected with criss-crossed red and gold cord lacing. The pants are brown poly interlock knit and have an elastic waistband. The knee-high boot covers are brown felt, with curved and pointed tips. 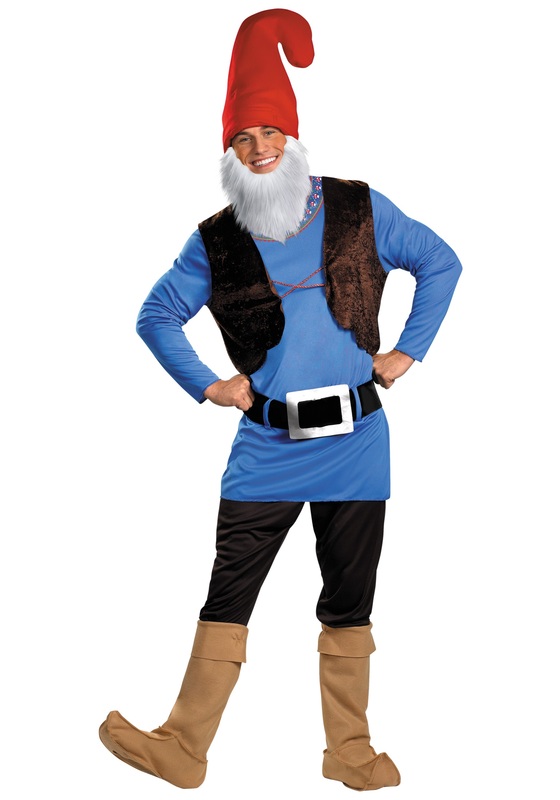 The red felt gnome hat also has a curved and pointed tip and has Velcro™ dots on each side where the white cuddle fur beard can be attached. Also available in standard size.